What difference is there between a glass of absinthe and a sunset ? Doctors kill more people than 'terrorists' do. When I first drank pastis, the very smell made me nauseous. Pastis was created in the twentieth century; the term (an Occitanian word meaning mixture', related to the 'pistou' or pesto of Provence, and also used to describe the original plum-pudding from Guyenne) first appeared, with reference to the drink, in 1932. It was a substitute for its much-demonised nineteenth-century progenitor: Absinthe. This was a strong, unsweetened spirit of Alpine origin based on the Wormwood family (mainly Artemisia absinthum), especially the original eighteenth-century recipe of Dr Pierre Ordinaire, later popularised with huge commercial success by Henri-Louis Pernod. 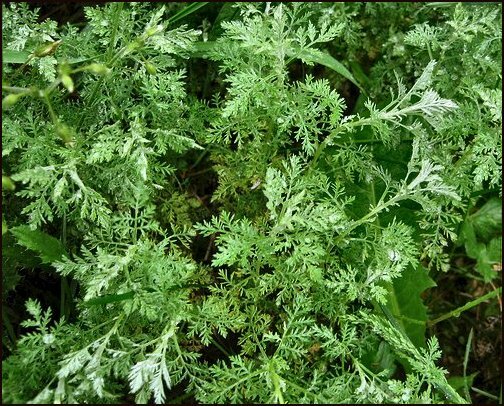 Wormwood is a bitter, 'cleansing' herb, and thus is very good for the stomach and gut. As its name implies, it could shock a tapeworm into letting go. 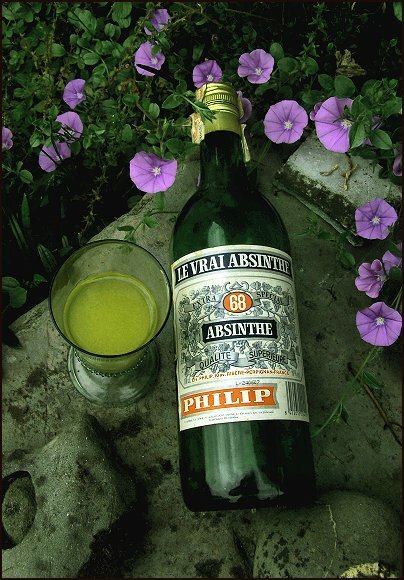 If you feel queasy or liverish, or have drunk too much, to chew a leaf or two of absinthe can work wonders. It was thus a staple plant in mediæval and monastic gardens. But by the 19th century, sweetness especially in the form of sugar had polluted and, along with a psychopathic obsession with meat-eating, seriously damaged western diet. Sugar's accompanying ills included diverticulitis and rampant dental caries so serious that the extremely poor, who lived on dark breads and rough vegetables, could survive for a while by selling their teeth to the rich. The absinthe leaf, together with other bitter herbs, was considered inedible, and was no longer used, except by travelling healers, who were victims of police oppression in France, because, like all itinerants, they were thought to transmit sedition against the corrupt rule of Napoleon III. But the tradition of its beneficent properties lingered, and it was added to alcohol partly in order to counteract some of alcohol's more deleterious side-effects. 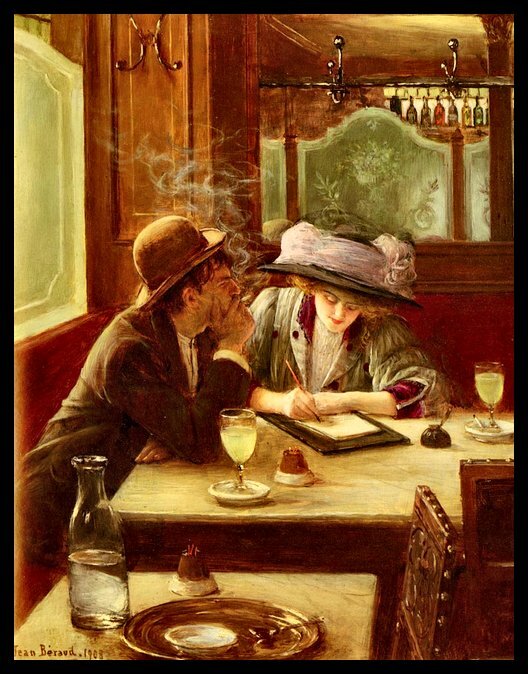 It was 'all the rage' in the 1880s and 1890s, and the French equivalent of the demure British Afternoon Tea was l'Heure d'Absinthe, around 5 pm. Because of its potency (real or imagined) consumption was limited to one glass, sipped genteelly. But naturally, the temptation to 'pub-crawl' was too great for those with miserable lives and little self-control or amour-propre. 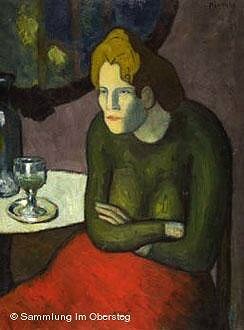 In the more proletarian establishments, from Le Rat Mort in the Place Pigalle to Le Caveau des Innocents close to Les Halles, poor-quality (probably toxic) absinthe could be drunk unmonitored, as was the less expensive rot-gut colonial red wine from Algeria. 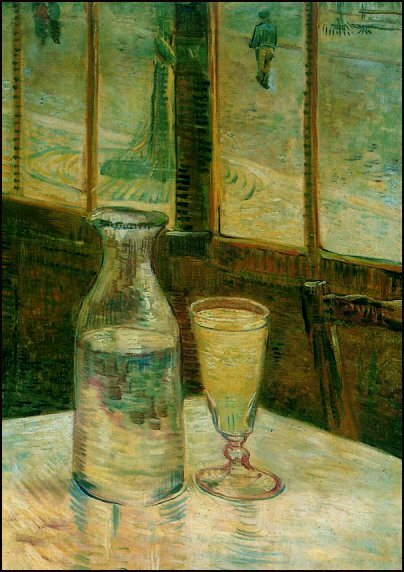 The most noticeable quality of absinthe, like that of its wan successor, pastis, is the cloudiness that occurs dramatically when water is added. 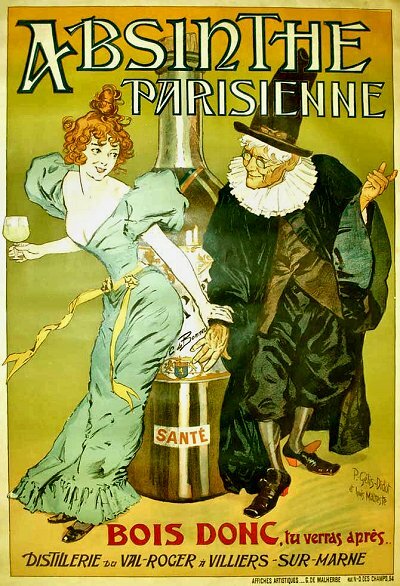 Already-sweetened, hence syrupy, alcohols (like crème-de-menthe) appeal only to the most infantile or degraded palates, so the very bitter absinthe was mixed with sugar and water after it left the bottle. Most absinthe recipes included Florence fennel and green aniseed as well as other plant extracts (such as hyssop) to add colour and depth to the taste. The final sweetening was provided by the drinker, who dripped iced water through a sugar cube placed on an absinthe spoon into the green liquor below. 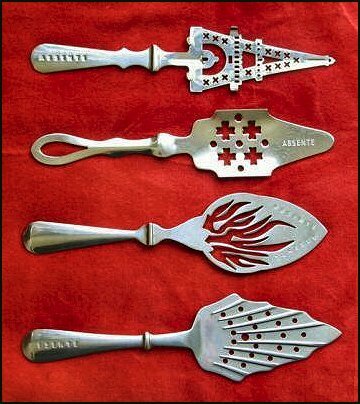 Absinthe spoons can still be found in antique shops in France, and sugar cubes remain popular. 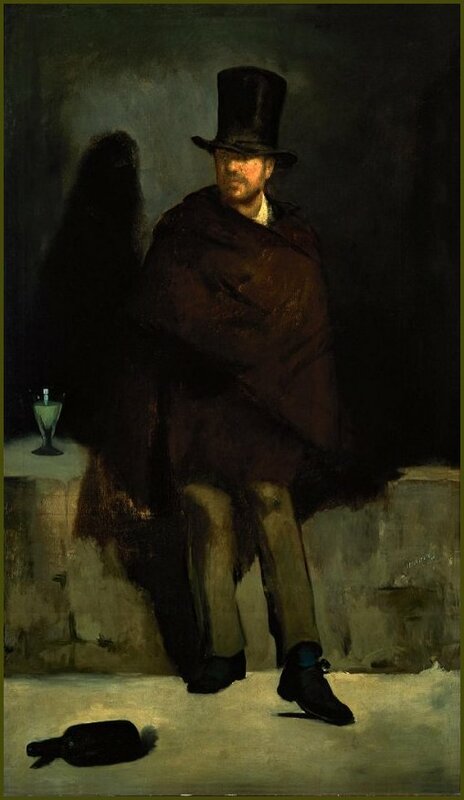 Absinthe is important in the history of modern art, because the first painting by Édouard Manet to be submitted to the Paris Salon was entitled The Absinthe-Drinker, a painting (possibly a self-portrait) which owes much to Courbet. Presumably the subject (a cloaked rag-picker lurking in the night) shocked people used to paintings of more refined individuals, because it was rejected. Manet then organised the famous Salon des Indépendants, where the Impressionists and post-Impressionists would exhibit their exciting canvases. 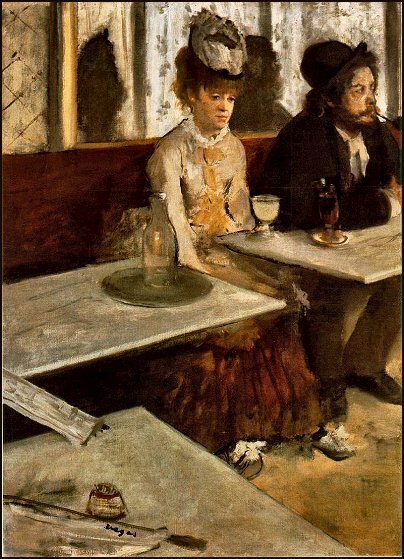 Degas' famous painting is hardly more cheerful. 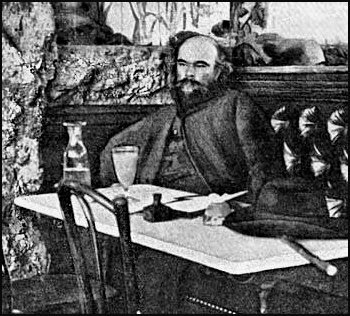 The most famous absinthe-drinker is, perhaps Paul Verlaine, who was celebrated for his poetry despite his lack of hygiene, his violent affair with Rimbaud, and his addiction to absinthe. His fellow-drinkers also included the even less hygienic Bibi-la-Purée and the celebrated symbolist poet Mallarmé. The highest-quality absinthes were not wormwood-extract plus industrially-produced alcohol, but grape alcohol, or a basic marc to which were added actual distillates of the two kinds of wormwood, with hyssop, fennel etc. To this high-alcohol liquor a maceration of more native European plants (such as Veronica officinalis) in grape spirits was added, in order to hold its natural green colour. Such a high-quality product was complex and intense, and louched beautifully i.e. turned a lovely shade of pale green when water was added. 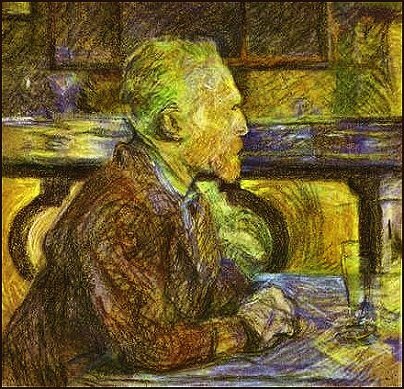 Van Gogh of course never drank the good stuff, but a cheap and probably nasty product which turned out more yellow (like pastis) than green. where the brothers van Gogh are buried. 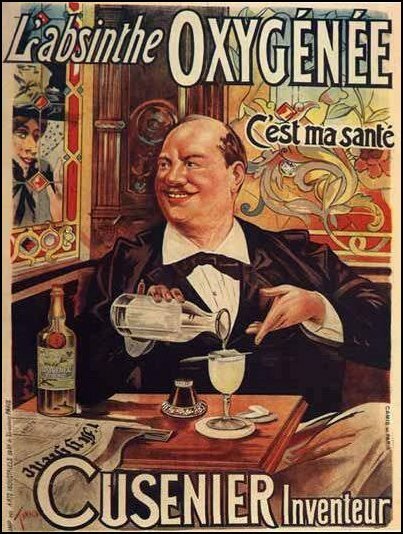 The late nineteenth-century was a time of far greater alcoholic excess in Europe than now; after the phylloxera epidemic, cheap absinthe became more widely consumed than wine in France. (Whereas in beery Britain, laudanum remained the drug of choice.) 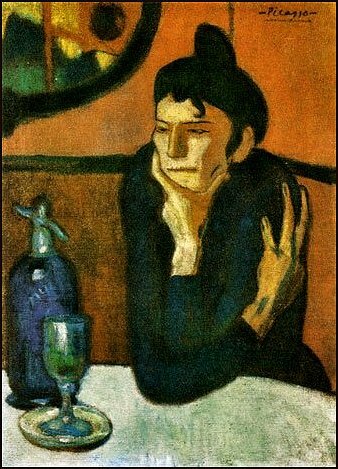 As a result, absinthe became the target of 'temperance' movements (aided an abetted by the wine-lobby), who claimed that the thujone contained in wormwood provoked hallucinations and insanity. It can indeed provoke hallucinations - in quantity, and smoked - and hence absinthe leaves can be combined with cannabis buds or leaves in a pipe. But, since absinthe-drinkers were often syphilitic (as well as tubercular) the symptoms of tertiary syphilis were ascribed to la Fée Verte. haunting or encouraging the drinker. and still hangs in a Prague café-bar. 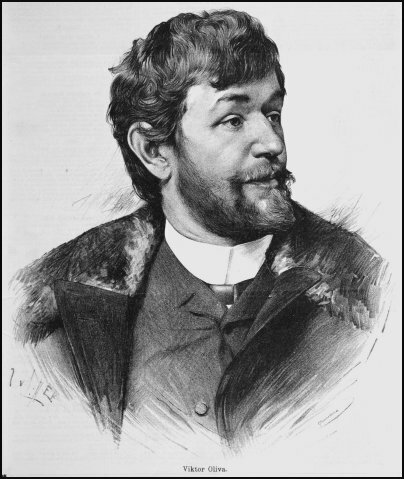 Famous crimes, such as the crime Lanfray - the murder by a French agricultural labourer (living in Switzerland) of his wife and children in August 1905 - were attributed to the almost mystical, maddening powers of absinthe - even though the murderer drank up to four litres of wine a day which he merely garnished with the occasional absinthe. 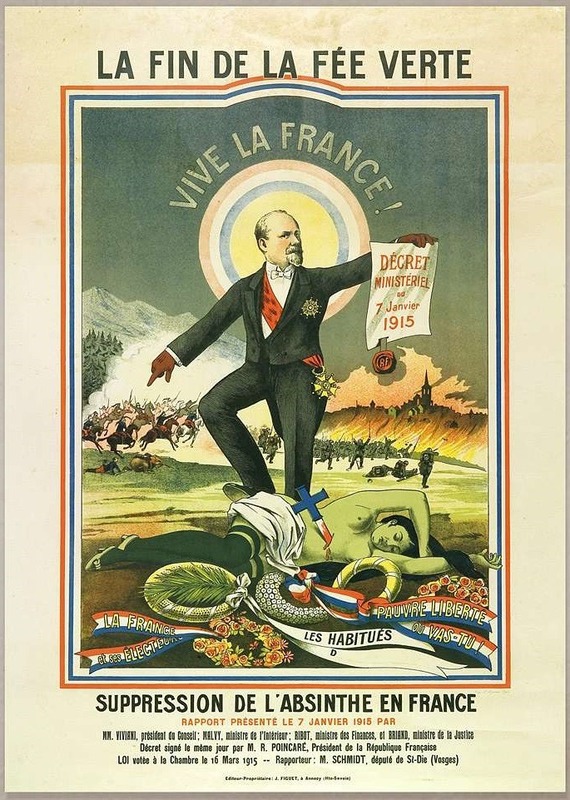 France eventually followed Belgium and Switzerland in banning the drink, in 1915 - in the middle of the first World War, probably because it was considered to "sap the energy" of soldiers and workers alike. "The End of the Green Fairy" - with President Poincaré trampling her body as if she were Marianne, symbol of the Republic. French manufacturers then turned to Pastis, though it only became legal to produce thujone-free, aniseed-flavoured drinks of 40% alcohol by volume after 1921 - the same year that absinthe was banned in Germany. Recently, however, German researchers working with US and British colleagues to test the level of thujone in 100-year-old bottles of absinthe found that it contained relatively low levels of thujone and that the psychoactive effects were very questionable. The scientists said in the Journal of Agricultural and Food Chemistry that the thujone level in 13 of the century-old bottles they opened averaged 25.4 milligrams per litre: well below the level of 35 mg of thujone per litre allowed under European Union regulations. The European ban was lifted in 1998, and absinthe is now popular again - in cocktail bars. It is unlikely to dent the popularity of semi-sweet pastis, which remains by some margin the most widely consumed spirit in France - where it outsells whisky, gin and vodka combined. This product played on a coincidence (?) of name. 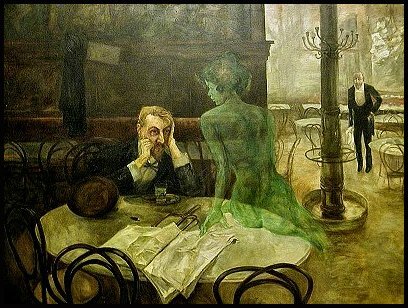 Absinthe was never banned in Spain. 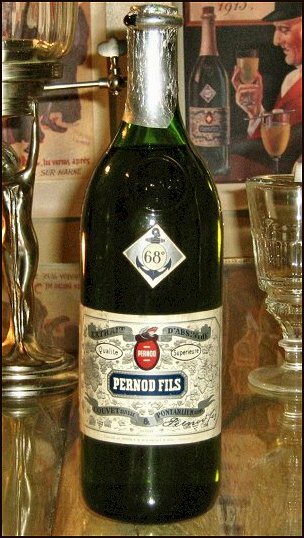 Pernod Fils (who, before the ban, made the best and most well known of absinthes) moved their factory to Tarragona, where they continued producing until the early 1960s. Other versions of it continue to be on sale, especially close to the French border. Some were nothing other than swindles, but others, like the one illustrated below, were 50% by volume (87.5° proof). The labels imitated the original Pernod labels. This bottle suggests that it comes from Perpignan, but very small print at the bottom of the label admits that it is a Spanish product. Two ingredients characterise pastis, and both are massively evident in France's biggest-selling brand, Ricard: aniseed and liquorice. There are other flavourings in Ricard, but it's hard to discern them. The aniseed flavour comes from star anise and fennel rather than the more expensive aniseed itself. Anethole is the key compound surrendered by all three. In addition to its intrinsic flavour, anethole is perceived by humans as thirteen times sweeter than sugar. One of the appeals of the drink is that it appears to be sweeter than it actually is - and hence doesn't cloy. 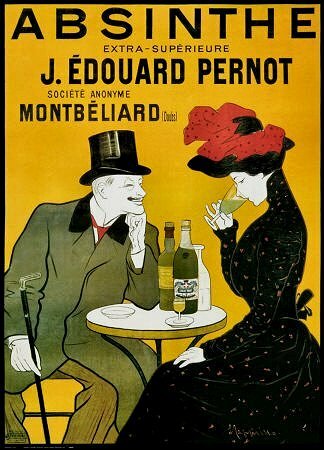 By this strict, two-ingredient definition, Pernod isn't a pastis at all but a boisson anisée, since it contains no liquorice; instead, its aniseed flavour is complemented by plants such as mint, coriander, angelica, tarragon (a relative of wormwood) and chamomile, and it is more highly sweetened than Ricard. Pastis 51 was originally a Pernod variant which did contain liquorice in contrast to the original, which bore the number 45. Other smaller brands include Sol-Anis, Casanis and Duval (both the latter produced in the same factory in Marseille) and the colourless Berger Blanc (now owned by the Franco-Polish group Belvédère). There are also 'artisanal' alternatives such as Eyguebelle, Jean Boyer and Henri Bardouin. The last of these is the most widely distributed of the three, and claims grand cru' status - though the notion of the cru or growth' is hard to sustain for a spirit whose main single ingredient is alcohol now derived from sugar-beet. The difference between Bardouin and its supermarket alternatives is in the complex recipe, containing (according to the company) some 65 different varieties of herbs and spice!. As a result, its taste somehow manages to be both complex and bland, and cloys the palate. In the south of France, Pernod is regarded as unforgiveably foreign and Parisian; Marseille, Provence and Languedoc (expecially Perpignan) are the 'home' of pastis. But to make your own, modern (lower-alcohol) Absinthe Surrogate is very easy. Simply buy a bottle of Casanis, Lidanis (from Lidl) or Duval (which cost little more than 12 euros a litre) and stuff a good sprig or four of Artemisia absinthum leaves or flowers into it, and leave for a week or so before you start drinking the wonderfully bitter ratafia which will result, and which you can strain and then mix like pastis with ice and water up to 5 times its volume - or just twice its volume if you like the taste of wormwood, as I do. Or drink it sec (neat) as a digestif. Some sprigs of hyssop will add more character. It will not be noticeably green. I leave it to your imagination and ingenuity to find an herbal ingredient which will make a pleasing pale green colour. It is worth noting that other, more common, plants contain thujone, notably Tansy (Tanacetum vulgare) and Feverfew. These can be added to the mix, though the taste of feverfew is not as clean as that of absinthe. Common sage also contains some thujone. European Union harmonised laws now ban not absinthe but any drink that contains more than ten parts of thujone per million of liquid. This is a tiny amount - a fraction of what absinthe contained in its sordidly-glorious heyday. On no account buy the expensive confections now sold in fancy bottles with devil-strewn labels (some of them made in the real Bohemia) as 'real' absinthe. At best, these are complex flavourings - excellent for ice cream. At worst, they are sickly parodies, crude and cloying to the palate. The best are 70% alcohol and supplied with droppers - and excellent for macerating cannabis-buds (for several months) to produce a drink interesting mainly for those who like to play with herbs and concoctions. A high-class brand called L'Extrême d'Absente (made at Forcalquier in Provence) declares on its label that it contains 'up to' 35 milligrams of thujone per litre. 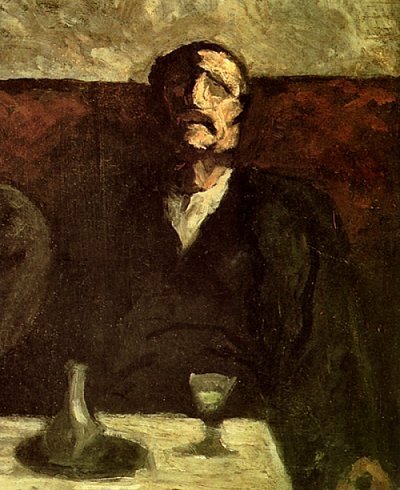 The very first painting of absinthe may well be Daumier's Smokers - though only one of the two men sitting at a table is actually smoking, The other one has a glass and a carafe in front of him, and seems to be somewhat remote from his surroundiungs. 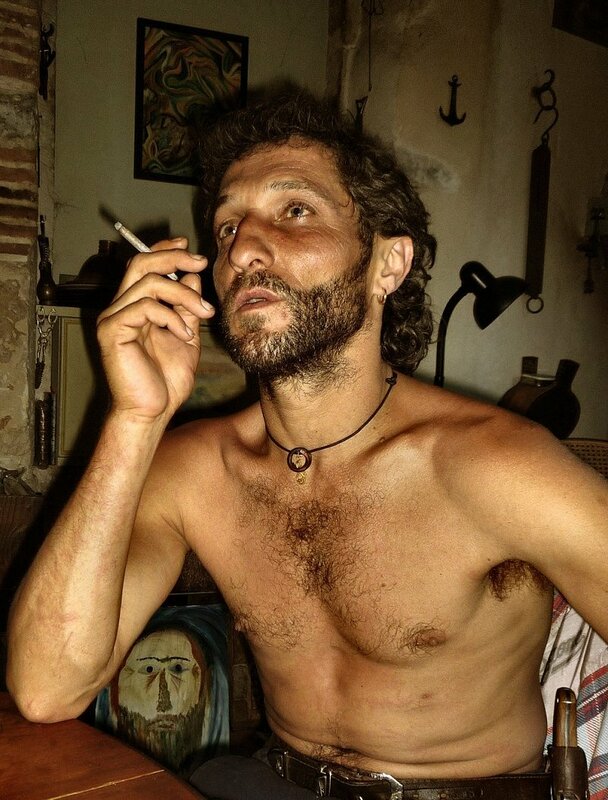 He well captures the 'out of it' expression which we nowadays might associate with cannabis or a pharmaceutical drug such as Ecstasy. 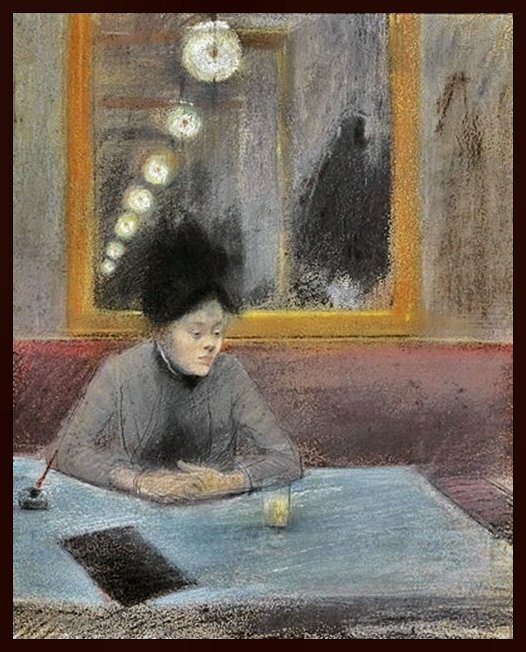 As I sip my ratafia de pastis aux feuilles d'absinthe, I will close this page with what I think is by far the most painterly and poetic treatment of alcoholism via The Green Enchantress: perhaps the only great work by Jean-Louis Forain (1852-1931), a pastel entitled La lettre et labsinthe, dating from around 1885. It contrasts sharply with the painting by Béraud, at the top of this page, entitled simply La Lettre.